Plantain has been around in Afro-Caribbean and Asian food shops for just about as long as the shops have been there and has become so popular that more and more supermarket chains now stock it in the fresh produce section. It takes about 8 days to go from green to yellow and about another 8 days from yellow to black. So, if you can’t find black ones, buy yellow ones and wait…. Plantain starts life green and unripe, firm and starchy. As they ripen the skins turn yellow and the flesh softens as the starch starts to convert to sugar. They continue their journey to full ripeness with the skins going a mottled black and then full black, the flesh goes soft and mushy and becomes sweeter and aromatic. Avoid buying shrivelled, squashy or mouldy ones. You can’t peel a plantain like you would a banana as the skins are just too tough, so you need a knife. 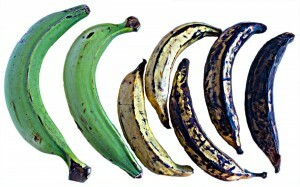 The simplest way is to cut off and discard the plantain ends. Slice in half crossways and then lengthways. If you want to keep the flesh in one piece, cut off the ends and run the tip of the knife in a single cut along the full length, just into the flesh, then peel the skin sideways, a bit like taking off a coat. 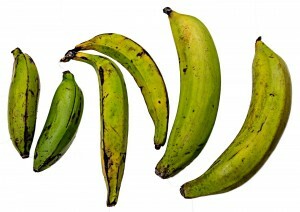 With green plantain the skin is really tough so you may need to make several full length cuts and peel it in sections. To avoid staining your hands with the starch from green plantain you may want to wear gloves or peel under running water. Green – a good alternative to potato, perfect for crisps, canapés and mashes. To boil, cut them lengthways and again crossways, cook for about 20-25 minutes and then peel the skin when cooled. Yellow & yellow-black – at its most versatile and an interesting change or compliment to many vegetables. Using yellow, just going black or yellow-black is a matter of personal taste. The more black markings the softer and sweeter the flesh will be. 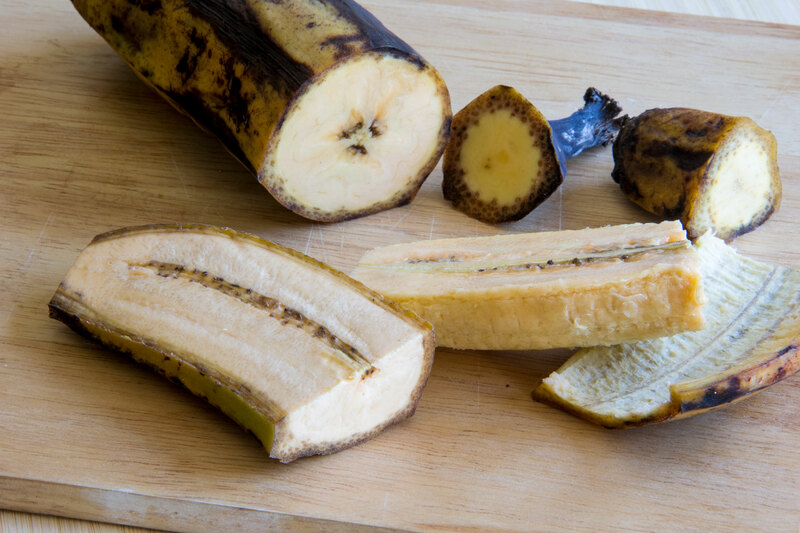 Steaming time varies with the thickness of the pieces and stage of ripeness and normally takes about 5-8 minutes for ripe plantain. The flesh colour will change from a pale peach to yellow as it cooks. Black – at its sweetest and an excellent ingredient for sweet and savoury dishes. 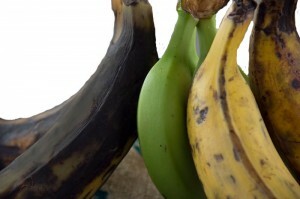 Like bananas, store plantain at room temperature and out of sunlight, not in the fridge. They can be peeled and the flesh frozen until you are ready to use it. Like the sound of it? My books A Date with Plantain and A Plate in the Sun both have easy, moorish recipes, or try out the recipes pages.